I am going to kill two birds with one stone with this post. 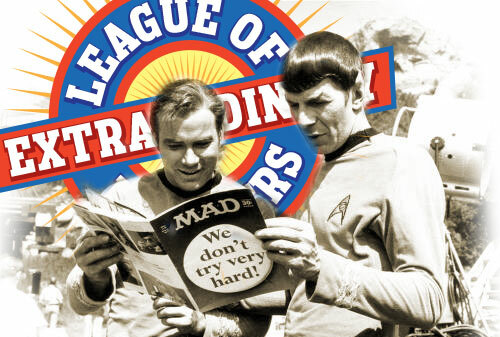 To not only complete my Day 16 post for my 31 Days to a Better Toy Collection Challenge, but also to complete this weeks League of Extraordinary Bloggers assignment: Star Trek. Day 15 of my Toy Collection project was not very productive and for good reason as my little apprentice had an earache and the cry for Daddy's help did not go unheard. Of course, her need of assistance was my only priority. In the morning however, she was good as new. My healing abilities apparently still are intact and when I asked her, "How do you feel?" Her reply was, "I feel like I can take on the entire Empire myself!" No, actually it was, " I feel great, Daddy!" That was great news, but not as to how I was now feeling. I was now feeling a bit under the weather. My Mom had been sick a few days prior and I think I had a mild case of what she had, but that still didn't stop me for what I had in store for that evening. Star Trek: Into Darkness. I used to watch the original Star Trek in syndication as a kid. I had a take it or leave attitude then. It wasn't until Star Trek II: The Wrath of Khan was released that I really took an interest in the franchise. I went on the see the subsequent feature films and watch The Next Generation series from it's beginnings and had a new found appreciation for Gene Roddenberrys creation. I never was a huge collector of Star Trek pop culture, but I do have a few Mego's of Kirk, Spock, Klingon and the gang. I even did a Star Trek week here at the Batcave Toy Room. I'm just more into the films. J.J. Abrams first Star Trek was a winner in my book and the follow up is no different. I don't want to go into spoilers, but if you're into Star Trek and haven't seen the new film Star Trek: Into Darkness, I suggest you hit it and go to warp to see it and tell me what you think when you're done. I was able to see it in style. Reclining in a leather chair with my choice of beer or wine, but I went with a diet Coke, and I loved it and would definitely see it again. Will hopefully be seeing the ST movie next week if I can. Sweet! Have fun JBoy. Let me know what you think. I think you'll enjoy it. Hey thanks for the shoutout! Anytime Hobby! Sharing is caring.